By my reckoning this is the 125th book I have reviewed this year and how wonderful it is to find gems at this stage in the calendar. Even the cover draws us in with images of a little-known event and another reviewer – John McCain, no less – calls it an “Action packed page turner.” He is absolutely right. 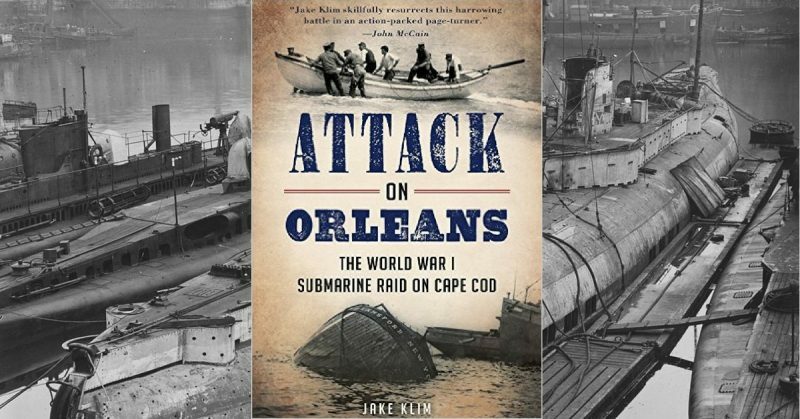 Jake Klim takes us back to a sleepy Orleans, a Massachusetts seaside town in July 1918 when the long-range submarine U-156 arrived offshore to attack the tug Perth Amboy and the four barges she was towing. The resulting attack cannot be described as the Kaiserliche Marine’s finest hour. The submarine, armed with two 150mm guns, poured dozens of shells at the tug and her charges until a hit on her bridge was finally secured. To say there was pandemonium in the town would be a massive over-exaggeration but the drama of the incident was an unforgettable event for those who witnessed it. Mr.Klim tells the story from the perspective of Coast Guard life savers who took considerable risks to row out to the damaged tug and a sinking barge to rescue casualties and people in the water. He goes into some detail about the townspeople who were there and how events unfolded. Stories of how news of the attack spread and how some people attempted to profit from the drama are fascinating. Perhaps most interestingly he is able to flesh out the saga of US Navy aircraft attempting to attack the submarine and the impact they had on the story. Events along the Mexican border aside, this was the first time in a century that a foreign power had attacked the mainland United States. Mr. Klim sets the scene by describing British incursions around the time of the War of 1812 when the Royal Navy was making mischief. He takes care to explain the history and geography of Orleans and its location on Cape Cod, a place I would associate as the playground of well-heeled high society as much as the home of hardworking fishing communities. 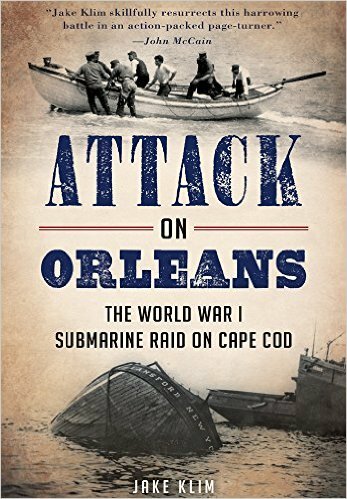 The book has its heroes and the star of these is the naval aviator Eric Lingard who had an immensely frustrating time attempting to sink the submarine. I really don’t want to spoil the plot any further by describing what happened here because I urge you to read this superb book for yourselves. I have said before that the big stories of the two world wars are all out there, the subject of constant reinterpretation by opportunist writers of varying ability. It is the footnote stuff from the big books that fill the pages of smaller titles like this one. Mr. Klim makes no attempt to drag his story out. There is no love interest or frippery like that to distract us from the main events. I am bound to say this story is the stuff of movies or TV dramas but it would need a degree of invention to stretch things out for Hollywood. Happily for us, Mr. Klim keeps his well-paced and absorbing story to just over a hundred pages. This is precisely how books that have been well-researched should be. No flab and no nonsense. I take my hat off to him. This book is, without doubt, one of the classics of the year. It presents a wonderful piece of ‘unknown’ American and Great War history using style and wit. The archive photography is out of this world. I really love this book. If you are looking for a belated Christmas stocking present for a historian chum then look no further. Outstanding. Reviewed by Mark Barnes for War History Online.